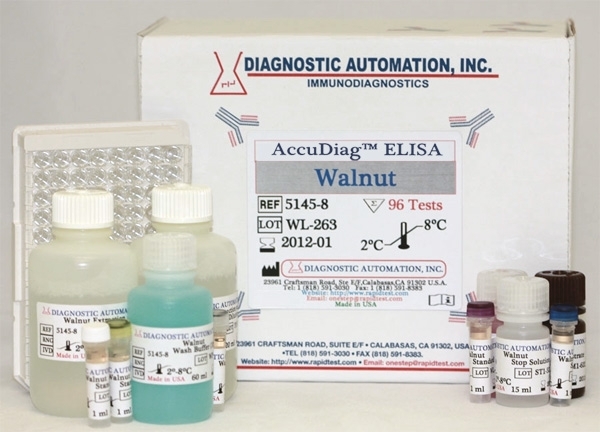 Diagnostic Automation Inc. offers an Aflatoxin B1 Food ELISA Kit that is an Enzyme Immunoassay for the Quantitative determination of Aflatoxin B1 in Food. 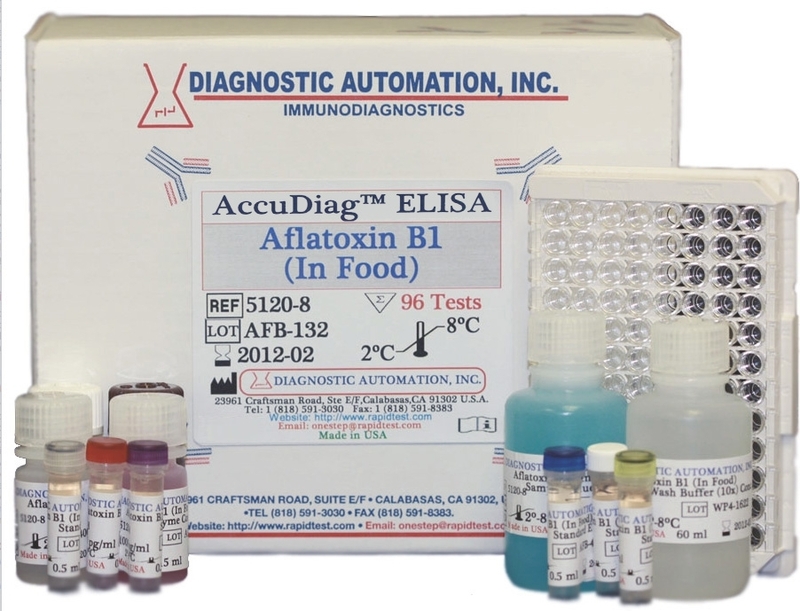 This Aflatoxin B1 Food ELISA Kit is a quick, economical, and sensitive Food Toxin ELISA Kit which is designed to detect Aflatoxin B1 in food. Aflatoxins belong to the class of mycotoxins. Chemically they are defined as difuranocyclopentanocumarines or difuranopentanolidocumarines, i.e. aflatoxins contain a dihydrofuran or a tetrahydrofuran ring, to which a substituted cumarin system is condensed. Out of about 20 known aflatoxins, the moulds Aspergillus flavus and A. parasiticus produce exclusively aflatoxin B1, B2, G1 and G2, and all the other aflatoxins are derivates of these four. 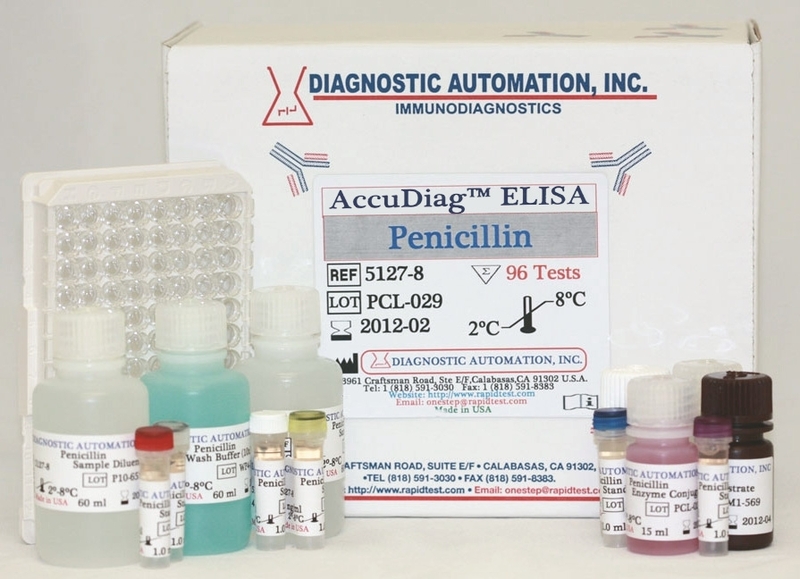 The derivates are developed either by metabolism in humans, animals and microorganisms or by environmental reactions. Aflatoxins are the strongest mycotoxins, which act primarily in a hepatotoxic and carcinogenic way. The four main aflatoxins show a different toxicity. B1 is without doubt the most toxic aflatoxin, followed by G1, B2 and G2. Both chronical and acute intoxications are effected by aflatoxins. 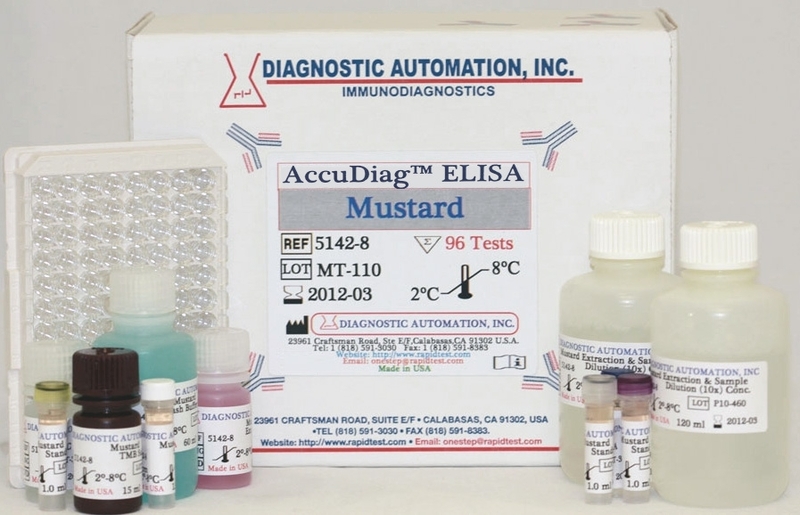 The Aflatoxin B1 Food ELISA Kit is a quantitative test based on the principle of the enzyme linked immunosorbent assay. An aflatoxin conjugate is bound on the surface of a microtiter plate. Immobilized and free aflatoxin B1 compete for the antibody binding sites.